“second” estimate for the first quarter, based on more complete data, will be released on May 31, 2012.
accelerations in PCE and in exports. This advance estimate is subject to significant revisions in the future — a full percentage point up or down is entirely likely. 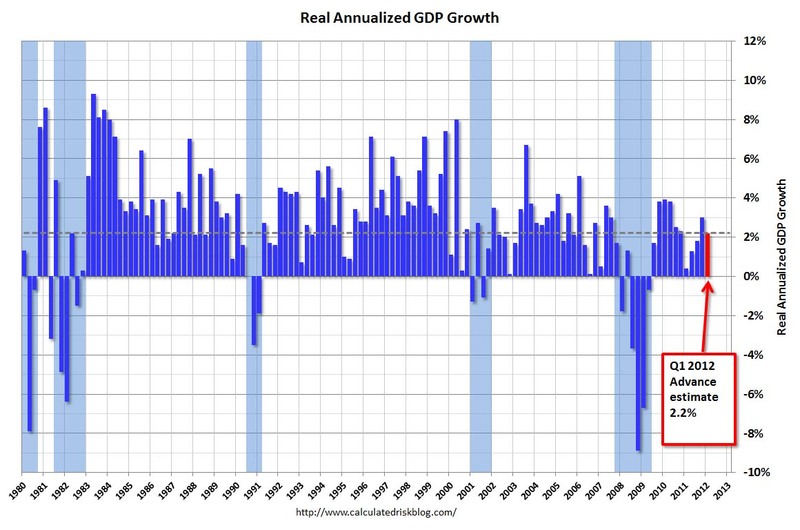 This is slightly below most estimates and somewhat disappointing — the U.S. economy will need faster growth to recoup all the ground lost in the 2007-2009 recession. Without the drag on GDP from government cuts, the rate would have been a much more respectable 2.8%. The federal government alone made a -.46% contribution to this estimate, almost entirely from military spending. Private residential investment contributed .4%. Even with new construction subdued still, the fact that it’s now making a positive contribution to GDP is critically important for sustaining the recovery. The biggest concern I have about this: Did the warm winter months actually boost economic activity, so the seasonal adjustment is actually giving us data that overstates the already-slow pace of recovery?